US Democrats have vowed to pass bills that would end a government shutdown, when they take control of the House when Congress reconvenes on Thursday. But the bills will not include funding for President Donald Trump’s Mexican border wall, the cause of the shutdown. The impasse will therefore continue, as Republicans still control the Senate and say they will not pass the funding bills without Mr Trump’s approval. The partial shutdown has now lasted 13 days, affecting some 800,000 workers. Shutdowns occur when Congress fails to approve a budget for government operations, or the president refuses to sign it, by a certain deadline. Mr Trump’s Republicans had passed a budget bill including $5bn (£4bn) funding for the wall in December, when they still had a majority in the House but they could not get the necessary 60 votes in the 100-seat Senate. The House majority now passes to the Democrats following the November mid-term elections. What are the Democrats planning? 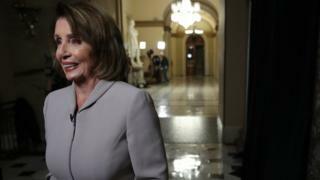 Nancy Pelosi, who is the new House majority leader, said the Democrats would quickly pass budget legislation providing sufficient funds to end the shutdown. But she was quite clear what it would not include. “There is no amount of persuasion he can do to say to us, ‘We want you to do something that is not effective, that costs billions of dollars,'” she said. Ms Pelosi also said she believed a sitting president could be indicted – although Justice Department guidelines disagree. The Democrats will try again to pass the blame for the shutdown on to the president, pointing out that the bills they will pass would be similar to legislation that had won bipartisan support in the Senate in December before Mr Trump signalled he would not back it. One Democrat bill would temporarily fund the Department of Homeland Security until 8 February, while another measure would fund other departments closed by the partial shutdown until 30 September. The Senate majority leader, Mitch McConnell, has said Republicans there will not back measures that Mr Trump does not support. He called the Democrats’ move a “total nonstarter” and a “political sideshow”. The BBC’s David Willis says the legislation would be dead on arrival in the Senate. What has the president said? He held a meeting with congressional leaders in the situation room of the White House on Thursday. Mr Trump sought to frame the discussion more in the context of national security than budgetary matters. There was no agreement with the Democrats, although talks will continue on Friday. US media reported that Mr Trump, when asked why he would not end the shutdown, had said: “I would look foolish if I did that.” A White House official later told Associated Press this meant Mr Trump believed it would be foolish not to pay for border security. In his first cabinet meeting of the new year, the president said the shutdown would last as long as it took to get his funding, adding “could be a long time or could be quickly”. Mr Trump reportedly told Ms Pelosi she should support the wall as she was a “good Catholic” and the Vatican City had a wall. What does the partial shutdown mean? More women than ever before won seats in Congress in the 2018 mid-terms. What does it mean for Congress – and America?